The battle of the giants Arnold Schwarzenegger versus Sergio Oliva at the Mr 0lympia 1972. Sergio Oliva also called "The Myth" because of his unbelievably huge size (he was 5'10" and 240 lbs) was the top bodybuilder in the late 1960's, he won the Mr. Olympia in 1967 and 1968. But then along came Arnold Schwarzenegger a young upstart from Austria who was arrogant enough to think he could beat anyone. Many still feel that Sergio and Arnold are the greatest bodybuilders of all time. But which one was really the best? The first was the 1969 Mr. Olympia where Sergio the defending champion beat Arnold and won his third consecutive Mr. Olympia title. Even Arnold, agreed Sergio was the best that day and was such a good sport that he kissed Sergio on the cheek to congratulate him. Next was the 1970 Mr. Olympia. Arnold had moved to America with the help of Joe Weider and worked hard for a full year with no other purpose but to defeat The Myth. At this contest many felt that Sergio came in a bit too smooth while Arnold had much more definition and hardness then the year before. Arnold beat the champ and took away his Mr. Olympia crown that day. 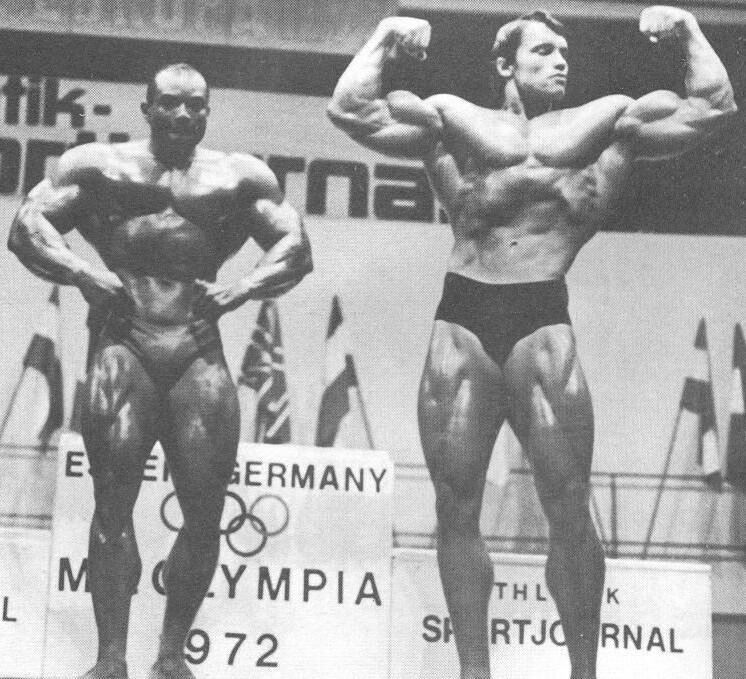 The last battle was at the 1972 Mr. Olympia in Essen, Germany. Sergio no longer underestimated Arnold, he trained hard and came in huge and tight, with a tiny waist and all other bodyparts as big as Arnold's despite being 4 inches shorter. Arnold many years later in an interview admitted that if he was the judge he would have given the title to Sergio that day. But it was not to be, Arnold won his third Mr. Olympia beating Sergio in what many felt was a controversial victory. Was Arnold, really better? Or did he psych Sergio out? Was it that back in the 1960's the German people would not have accepted a black man beating an Austrian? Look at the above picture and you be the judge. All I can say is that I wish I could have been there to witness those contests featuring Arnold Schwarzenegger vs Sergio Oliva, in my mind they are both the top bodybuilders of all time.